If you were to rank the original Star Wars trilogy, your ranking would most likely have Return of the Jedi in third. That’s understandable. The film is certainly not as groundbreaking as A New Hope (which I still call just Star Wars), and it’s not as dark and foreboding as The Empire Strikes Back. It’s easy to dismiss Return of the Jedi as a lesser film. George Lucas admits that he made some film choices with marketing and toy sales in mind, and part of his choice making involved deleting pretty cool scenes like leaving Tatooine. While ROTJ has some flaws, it is fundamentally a strong movie, once you strip away some unnecessary layers. The first real complaints are usually about the return to some earlier, familiar settings. This was seen by some as lazy filmmaking. In an entire galaxy, why rehash Tatooine and the Death Star? In ESB we traveled to Hoth, Bespin, and Dagobah. The newest locale in ROTJ was the forest moon of Endor. Which, now that I think of it, I don’t know the real name of. Was the moon a moon of a planet called Endor, or was the moon itself called Endor, like the United States OF America? Regardless, these complaints were valid up to a point. Lucas returned to Tatooine because that’s where Han Solo was being held by Jabba the Hutt. The return to the Death Star was more to demonstrate how stubborn and megalomaniacal the Empire was in building a second, larger planet-destroying Space Station. These projects cost tons of money, and the Empire wasn’t exactly printing it themselves. Therefore, Lucas had to return to the Death Star in order to destroy it to show the reader that the Empire could be economically crippled and defeated. As far as the forest moon of Endor, Lucas has stated that he based the idea of the setting, and those damn Ewoks, as a tribute to the native tribes who once lived among the California Redwoods, the Miwoks. This brings us to the second major complaint about ROTJ, those damn Ewoks. If nothing else, George Lucas has more in common with Gene Simmons than with Steven Spielberg. Lucas makes money off of licensing hand over fist. The Ewoks were a cutesy cash grab, nothing more. They were originally supposed to be Wookies, but obviously Wookies aren’t quite as cuddly as fuzzy Muppets are. The idea was that an indigenous tribe, using their primitive technology and moxie, would be able to defeat a vastly superior, more well-trained army. I understand the vitriol here. The movie would’ve been better served with a more hardened group of fighters. So Lucas saw dollar signs and his geared his movie in that direction, at the expense of strong and interesting storytelling. Third, Lucas killed off an iconic character in the most undignified and utterly childish way. The character of Boba Fett was revered by many. He represented the unknown badass, a Clint Eastwood in Mandalorian armor. After his successful acquisition of Han Solo, he was steeped in mystery. How big of a role would this character play going forward? Well, not too terribly big it turned out. Lucas killed him off in a stupid way, and even made the juvenile decision to have the Sarlacc burp after eating Fett. Again with the cutesy. While these are all valid reasons why ROTJ is deemed as weak, there are many more reasons why it’s a grossy underrated success. First, the fight scenes at the end of the film convey the feelings of pure desperation. The battle in space outside the Death Star was unlike any aerial dogfight ever shown before on celluloid. The sheer insanity of so many ships fighting in such small quarters was incredible. From the small armada jumping to hyperspace, to flying into the teeth of the TIE fighters, to the imposing Star Destroyers hanging back, the battle was worth the price of admission. The scenes were beautifully scripted, shot, and cut. People forget just how innovative the technology was at the time. The fight on the forest moon between the Rebels and the Empire was necessary, but again if you’re not a fan of the Ewoks, then this fight was scoffed at. Second, the battle between Darth Vader and Luke Skywalker was fantastic as well. It demonstrated how far Luke had progressed in his development as a Jedi. For starters, he constructed his own lightsaber in Obi-Wan’s hut on Tatooine. This was necessary because his old one was lost somewhere beneath Cloud City. Luke fought with both offensive and defensive maneuvering, and the ebb and flow of the battle was engaging. Goaded by the Emperor, Luke gives in to temptation and takes the fight to Vader. When Luke retreats and is taunted by Vader regarding Leia, Luke taps into the dark side and viciously attacks him. Only after the damage is done does Luke examine his choice and reject the dark side, famously telling the Emperor, “You’ve failed, your highness. I am a Jedi, like my father before me.” This leads me to my next point. Up until this point, the Emperor had only been seen through a holographic image in ESB. Here he was menacing personified. The Emperor’s cruel treatment of both Luke and Vader cemented his standing as the foremost evil despot in the galaxy. Ian McDiarmid’s portrayal of the Emperor was a standout performance. He created a character that was simple yet layered, because we know he wanted subordinates yet we don’t know why. As the singular ruler of a galaxy, one would think that he’d want to centralize his power, not share it. Perhaps he treated his subordinates as playthings, constantly keeping them under his thumb. However, this was his undoing. Finally, Darth Vader rejected the rule of his Master and instead saved his only son. Here is where the movie really makes sense. Think about the title, Return of the Jedi. Most people view it as the return of the force wielding monks who will be the guardians of peace and justice in the galaxy. 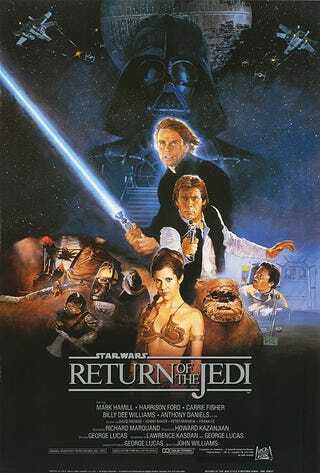 Instead, I want you to think about like this - put the emphasis on the word “the” in the title: Return of THE Jedi. I think the title refers to the return of Anakin Skywalker, THE Jedi, the one who will bring balance to the Force. When you look at the original trilogy, it becomes the tale of two Skywalkers, both becoming the Jedi they were born to be. When you look at it from that angle, Return of THE Jedi, the trilogy takes on a whole new meaning. While there are some obvious flaws with the film, Return of the Jedi is at its heart the completion of two story arcs, one smaller (Luke) and one larger (Anakin/Darth Vader/Anakin again). If you rewatch it and pay attention to just the focal points I mentioned, the movie is worthy of no lower than the top five of anyone’s Star Wars ranking.